Happy New Year to all my fellow vintage Hamilton enthusiasts and casual collectors! Like a lot of folks, I got to enjoy some time off over the holidays which meant I could catch up on some of the project watches that I've had sitting on my bench for a while. Check out my Etsy site if you think one or two might be of interest. 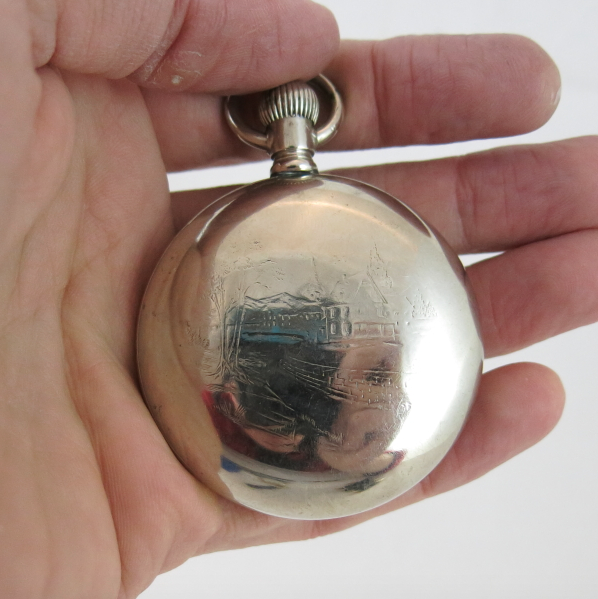 My passion for Hamiltons started with a couple of family heirloom pocket watches. There's something to be said for the loud ticking of a pocket watch - reminds me of the end of "Sixty Minutes" after Andy Rooney would finish his bit. Anyway - pocket watches are much larger than wrist watches and require a different set up in my "work flow" so I tend to get to them when there's a lull in the backlog. One of my recent projects was a 1909 17 jewel 926. This grade of movement was produced from the turn of the last century into about 1913 or thereabouts. In an open-face configuration the 926 is used and when it's in a hunter-case (clamshell) a 927 would be used. The 927 would have the pendant at the 3 position instead of the 12. 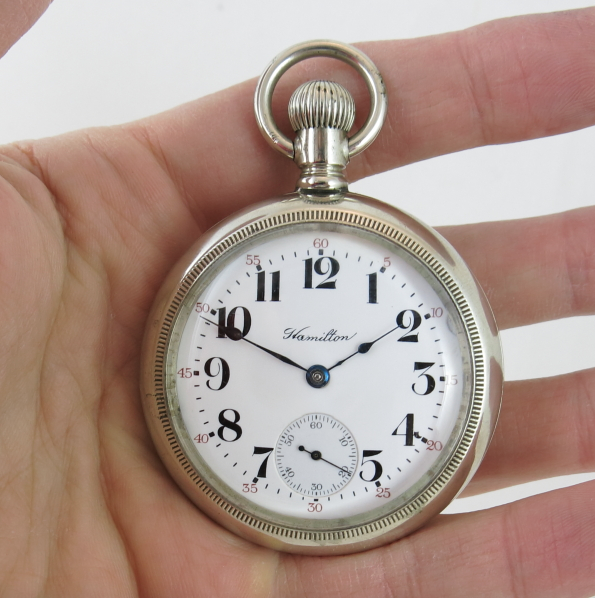 The 926 is an 18 size watch - the largest pocket watch that Hamilton typically made. It's a step up from the 924 (and 925) in that the 926 was adjusted for temperature. Now depending upon who you ask, the 926 is technically not a "railroad watch" - although you will often hear it described as such. Back in the day, civilization was dependent upon watches and clocks to organize society and keep everything working smoothly. It was not unusual for trains that went in opposite directions to share the same track - and the only thing that allowed them to move at full speed was the high confidence that another train wasn't already on the same track heading toward them. That confidence came from everyone synchronizing their watches and their watches being accurate. movement capable of adjustment to at least five positions - the positions a watch might normally have when in use… dial up, dial down, crown up, crown to either side, etc. lever-set, so there would be no risk of the watch time being accidentally changed. A 926 meets a lot of these requirements but not all of them. The 940 grade is really the "entry level" of railroad approved Hamilton watches in the 18 size. 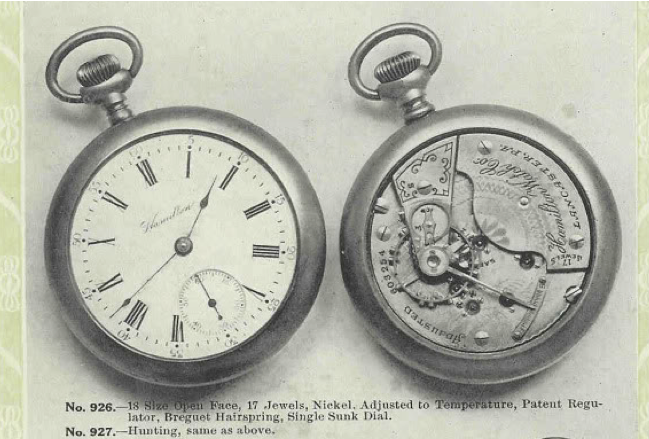 Anyway - in the early days of Hamilton watches, it was not unusual for the customer to pick out the movement they wanted and then choose a case for the jeweler to install it in. Hamilton offered a limited line of Hamilton-branded cases too - but you'll find a broad variety of cases out there. My project watch came in a silverode case - which is a nice way of saying "nothing special" other than an inexpensive alloy of nickel, copper, and manganese. Different case makers called the alloy different things… silveroid, silverine, etc. but really there is nothing silver about it other than the color. I have large hands and you can see that this watch almost fills my palm. The case is about 60mm in diameter so this is a substantial watch. You can see why the slightly smaller 16 size railroad watches became more popular with railroad men. They're large but not quite this significant. The 926 is elegantly damascened and highlighted with gold accents. The balance wheel is about the size of my thumbnail and I find it fascinating to watch as it keeps beat at 5 times per second. In order to get this watch to keep time I had to move the regulator all the way towards "fast". I think most people like to see the regulator toward the center of the scale. In order to move it to the center (and still keep time) I would have to either change the weights on the balance wheel or shorten the length of the hairspring. Both are complex operations so I think the old rule of "if it ain't broke, don't fix it" firmly applies. The inside of the case back is clearly marked "Silverode". The interesting thing about these old 18 size watch cases is they are often engraved on the back with interesting scenes like trains, large antlered deer, and in this case a village setting of some sort. I think the best use of these watches today is for display under a glass dome. The dials are as large as, if not larger than, a carriage clock. They will run for about two days on a full wind though - so you have to visit them regularly to keep them ticking away. The 926's built between 1905 and1915 were double roller and steel escape wheel. Where to find hairspring for Hamilton 940 21 jewel, 18 size? Probably from another 18S Hamilton grade. The earlier 940's had a single roller and the later ones had a double roller. So if you want to swap balances from a donor movement you want to make sure you get the correct version. Odd are if you change just the hairspring you will have to do some significant adjustment to make sure the balance is properly poised. 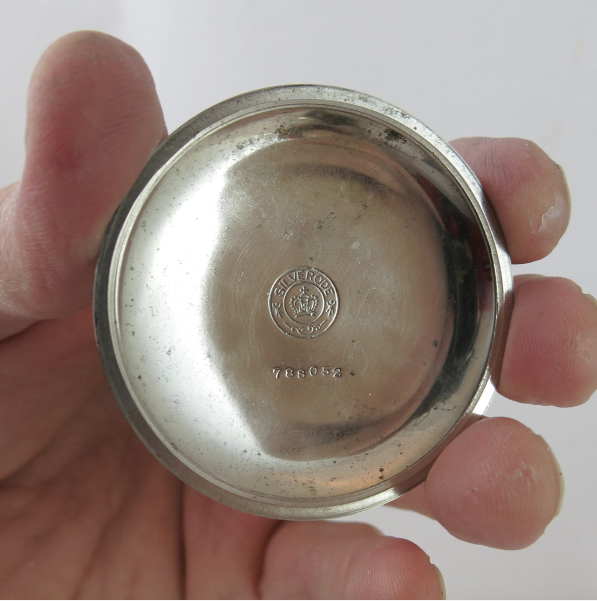 Do you know anything about the Silverode pocket watch case of where it is made? I have the identical case you have shown but with the movement labeled NEWERK USA, and not Newark. If these cases were made in England as the crown indicates, may be the spelling is wrong? How can I identify where the movement is made and by whom? My case has a stag engraved on the back. You may answer me at lmds@telus.net. I live in Canada. I have not been able to find out anything about my watch, only that the dial has Mail Pouch written on it, which can only been seen if you look at the label from the side, as the ink is long gone! After a good cleaning and oiling by a Swiss watchmaker and an adjustment for speed, it keeps time as good as a quartz watch! I would love to hear from you! Thanks. 9:45 AM Nov. 19/2017. Unfortunately I don't know the answer to that one. Where can you find basic parts for 926 movements? Such as, hairsprings, balance staffs, balance wheels, mainsprings, or crystals? Not to sound overly flippant but you really need to have a little watchmaking acumen before you can benefit from having spare parts. Watchmakers go to school for upwards of two years to learn their craft... and they learn how to source parts or make them if necessary. So pros know where to find what they need. When one is not a pro, then what? First, go to a pro and let them do it. If that's not an option, you need to build experience. As part of that you'll want to purchase an old parts catalog and identify all of the part numbers needed for various grades of watches. A lot of watches use the same parts, for example. Then you just have to call around to watch part supply houses until you find what you need. Most watch parts supply houses deal only with pros - so you need to know what you're doing or they'll turn you away. Of course you can just look on eBay for donor watches... that usually works. Last resort is to build a time machine and go back 90 years to when these parts were new and commonly stocked. Sometimes that seems like the only solution, and it's not much of a solution at that. In that case, where can you find old parts catalogs, or parts for a time machine? To be completely honest, I'm really just starting out to the watchmaking world and profession. I have a 926, a 992e and a 752 that all need repair. Could you give me some tips on how to start out repairing these three watches? This is a great site. Not many "real" hamilton enthusiasts still left. This is a very sharp pocket watch, and great job. By the way, if I were to order a 926 movement and a case isn't available at the time I get it, is there another way to wind it besides the having the case? Yes - you can wind a negative set movement like the 926, etc. with a "bench key". Google "pocket watch bench key". It's basically a square shaped rod with a handle that fits into the square hole of the movement. They come in different sizes to match the different size stems that you might find out there. You might have a screwdriver that will fit diagonally in the hole (corner to opposing corner) and allow you to wind it. It's also important to use one to let the mainspring down - as if you try to use a screwdriver on the barrel arbor screw you'll likely scratch the ratchet wheel (or worse). If I have a case that fits, I just use that to wind or unwind a movement. It's quite secure that way. You can also make your own bench keys with spare stems from damaged cases and pin-vise to hold it. Will a 927 fit in a 926 case, or is it for hunting cases only? 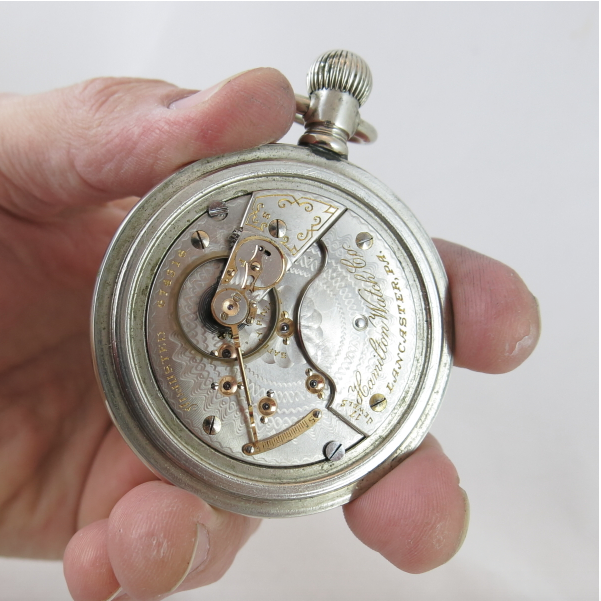 Both grades should fit in the same cases, just the orientation of the dial and position of the second hand relative to the pendant will differ. Just bought a 926, gold filled off Ebay (100% rated seller) and am anxious to join the Hamilton club...this on is size 18, 17 jewel which is standard I guess...Temperature adjusted and guaranteed to keep accurate time. Time keep adjustment is also set to almost fully "fast"....hope I won't need to adjust it any, if so, it's going to a good watchmaker/jeweler. My granddad had an old Hamilton, which I would have loved to get but alas, don't know where it went. I will pass this one on to my grandson. Great site. Thanks.